Each June, for the last 92 years, a 24 hour endurance race is held in Le Mans, France. While the cars and circuit has changed over the years, it remains one of the most loved and hardest fought endurance races each year. Like in years past, you can race the Circuit de la Sarthe virtually thanks the team over at Electronic Arts and FireMonkey in Real Racing 3. 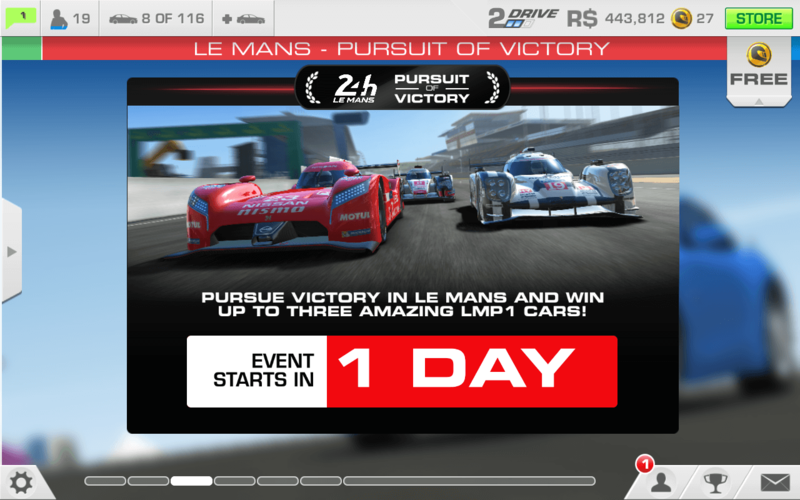 The popular racing game has been updated once again (version 3.4.0 for those keeping score at home) to bring some of the World Endurance cars that will be racing in the 2015 24 Hours of Le Mans along with challenges to compete in and complete during the next few days. The update is a bit beefy at 45MB so you’ll need to make sure that you are connect to Wi-Fi to install. While the game is free, you will have the option to buy currency to update your cars, etc. It can get a bit spendy but I will say as one who has been playing the game for some time, you can avoid spending the money if you are patient. An interesting update. It’s too bad EA once again demonstrated its greed and disregard for its customers by ALSO increasing the cost of crew hire from 1 to 5 gold and drastically decreasing fame rewards for other races, all in the hopes for forcing players to spend more money. I’ve abandoned the game. I played daily and had reached level 139. I recommend EVERYONE reading this follow my example. It’s time to send these people a message.